Chevrolet began a partnership with Warner Bros. back in 2017 when The LEGO Batman Movie launched in theaters, with Chevy heralding the collaboration by showing off a LEGO version of the Batmobile. Now, Chevrolet and Warner Bros. are back at it again, teaming up with FIRST LEGO League to unveil a full-size LEGO Silverado at the North American International Auto Show in Detroit. This LEGO model is an exact representation of the all-new 2019 model year, particularly the LT Trail Boss trim. Eighteen trained LEGO Master Builders pieced together the full-size LEGO Silverado using 334,544 bricks. The entire process took over 2,000 hours at the LEGO Group’s model shop in Enfield, Connecticut. The end result is 6-foot tall, 20-foot long, and 8-foot wide plastic car weighing 3,307 pounds. The LEGO Silverado is not a working model; it does, however, have working lights and graphic details on the exterior. What’s the occasion for the build? 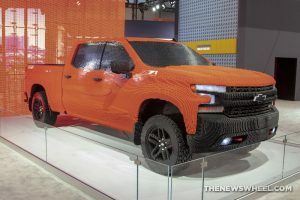 Chevrolet is celebrating that the new 2019 Chevrolet Silverado High Country will make an appearance in LEGO Movie 2: The Second Part in the form of a custom LEGO mini-build. If you want a real-life Silverado that’s much more durable than a plastic model, visit Sharon Chevrolet. We have plenty of trucks in stock — no assembly required.